How much does it cost to travel to Milan? How much money will you need in Milan? €108 ($121) is the average daily price for traveling in Milan. The average price of food for one day is €28 ($32). The average price of a hotel for a couple is €130 ($146). Additional pricing is in the table below. These average travel prices have been collected from other travelers to help you plan your own travel budget. How much money do I need for Milan? Milan, known to most of the world as the capital of fashion and style, is also the heart of Italian industry and economics. Between the stock exchange, cathedrals and boutiques, this metropolis is a city-lover's dream come true. It is an escape from the stresses of the real world, and provides a playground for all the world's most lavish luxuries. While it's got centuries of history under its belt, Milan has still come to represent the new' Italy. The city has preserved its history, but requires a bit of exploring. Most European cities shove their historical attractions in your face, but not Milan. There is something different about this city. It might be the grey architecture. It might be the high speed pace of the locals. Something about it makes you feel like you've left Italy for a bit, but don't worry, there are Italian gems sprinkled throughout Milan. Most people use public transportation to get around Milan. The system includes a tram, trolley-bus, and bus lines, as well as three different metro rail lines. The three subway lines include a red line that runs northeast and west. The green line runs northeast and southwest, and the yellow line runs north and south. Milan has a major airport that some people may use as their entry point into Italy. Alternatively, it's possible to take the train or bus from most major cities throughout Italy. Trains are generally more comfortable and convenient, but buses are often cheaper and will save you some money. Many people choose to skip Milan as a travel destination in Italy, but those that stop by are generally well rewarded. It's an easy stopover, particularly for travelers between Cinque Terra or the coastal areas in western Italy and Venice. If nothing else, it is recommended that you allow for a few hours layover in Milan. The restaurants are very cosmopolitan and delicious, the shopping is some of the best in the world, and the wine is delicious. The sights manage to mix history with modernism, and a visit to Milan allows you to see a whole new side of Italy. Milan is full of amazing sights for any traveler. There are historic churches, ancient palaces, impressive museums and world-class theatres. If you're a fan of Renaissance and Baroque style art, you'll be happy in a number of Milan's beautiful museums. The Pinacoteca di Brera is home to one of Italy's most important art collections and one of the largest collection of Italian paintings. The Pinacoteca Ambrosiana houses world famous paintings, while the Civico Museo Archeologico is home to Roman antiques, statues and glasses. 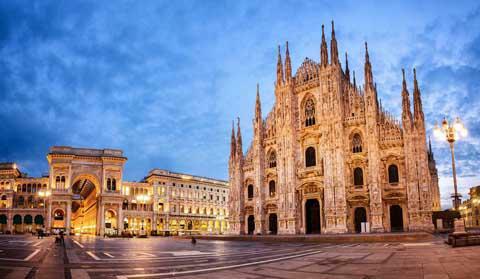 As the former northern capital of the Roman Empire, Milan can claim the oldest churches in Italy. The Duomo in Duomo Square is Milan's main cathedral. It is, without a doubt, a must-see attraction in Milan. This massive gothic church was started in 1386, and built from white marble. Make sure you take a trip to the top to see stunning city views between ancient gothic spires. But if sitting back with an espresso is all the sightseeing you want to do, make sure you relax in the Piazza del Duomo. It's the grandest square in all the city. This gathering spot is home to the Duomo, the Royal Palace and an enormous statue of King Victor making it the cultural and social heart of the city. The nearby Galleria Vittorio Emanuele II is full of shops and restaurants set in a 19th century arcade-style building. From the Duomo, the Galleria Vittorio Emanuele II spreads to the north. To the northwest of the Piazza runs the Via Dante up to the Castello and its surrounding park. In and around these sights and the nearby maze of streets are the main tourist areas with shopping and old, quaint architecture. The first activity on your list should be to simply walk around and take in the sights and sounds of Milan. However, once you've done that, there's plenty more for an active traveler. But read this to learn what to do with only 1 day in Milan. Catch a football (soccer) game at the famous Giuseppe Meazza Stadium, or attend one of the many exhibition fairs held throughout the year. Wander through any boutique for a taste of the famous Milan fashion world, or make your way to the top of the Branca Tower for stunning views of Milan. You will not go hungry in Milan. This city is known for its tradition of Italian cooking. You'll easily find a trattoria, enoteche or restaurant anywhere offering traditional Milanese and Italian dishes. Don't miss out on specialty dishes like osso bucco or risotto alla Milanese. You have several options when trying to travel a round Milan. The Azienda Transporti Milanesi (ATM) system operates a rather efficient public transport network. Single tickets (valid for 90 minutes) are cheap and available at newsstands, bars and automated ticket machines at each station. You can also buy 24 hour, 48 hour, or 10 ride tickets. Do not forget to validate your ticket before getting onboard! There will be a small box at the station that will stamp your ticket with a date and time showing when it was used. Do not forget to do this, or you will be fined onboard. There is also a Metro system marked with a big, white M" on a red background. There are four lines to take you around the city, and a new train runs every 1 -3 minutes. Be sure to watch out for aggressive pickpockets. If you'd prefer to stay above ground, there are trams and buses available. Taxis are an expensive option. Note that if you book a taxi over the phone, they begin charging the moment they take the call and come to pick you up. Renting a car is not recommended in Milan. Traffic is a considerable problem, and parking is nearly impossible. Walking is a definite possibility as most of the main attractions are a short walk to one another.